Photographer: Rankin. Model(s): Alice Hurel, Angel, Emma Laird, Scarlett. Stylist: Kim Howells. Makeup: Andrew Gallimore. Hair: Nick Irwin. 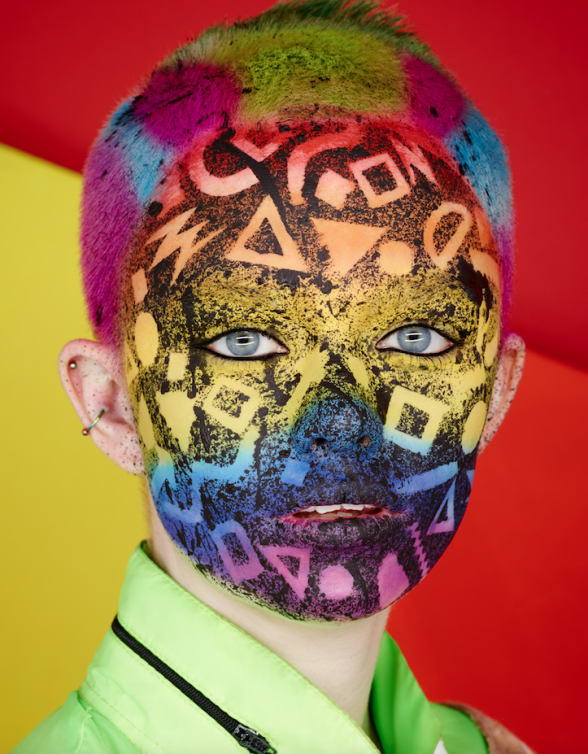 Rankin and Andrew Gallimore combine avant-garde artistry with 90’s neo-pop in “Saved by the Bell” for Hunger Magazine. This captures the chaos of color that defined those times. It’s a dramatic blend of bold that brings us back to the day. However, like with any trip down memory lane, we tend to take a few liberties in the recall department. Enshrining that, or any, era simply demands it. Looking back on this time period I am struck by the simplicity of styles. Backed by a series of color blocked walls, Kim Howells uses the stories’ theme as a jumping off point for her fashion lineup. Neon green is marked by a black zipper that runs around the jacket’s neckline, while stripes of orange & yellow are branded with brilliance. A fusion of electric, magnetic madness follows suit, as a tie-die version of pink & blue stay in that same hue. These combinations capture a sense of chaos, while anchoring themselves to the idea of innocence. Color-blocks are enhanced with linear shapes, while embellishments come in the form of fringe, rope, lace and silk. 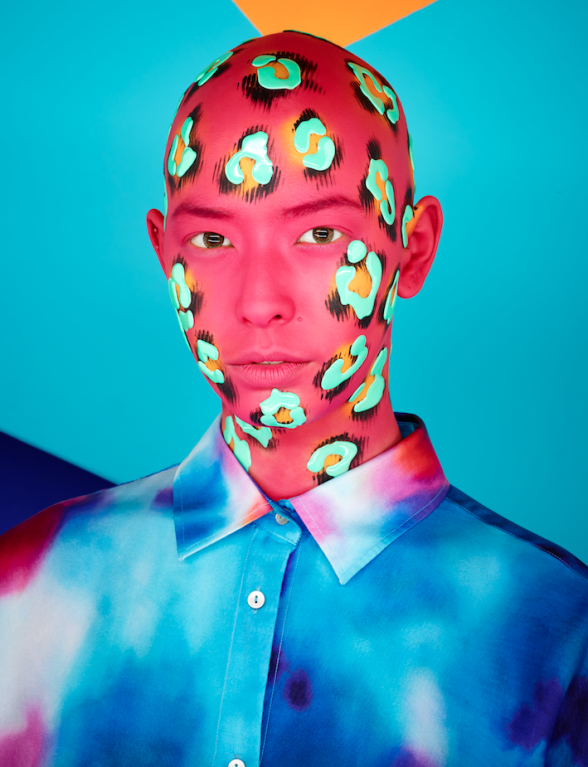 Andrew Gallimore has fun with high fashion, by applying a conceptual take to 90’s face art. Fabrics don’t just enhance, they are made to match the makeup embellishments. Leopard marks start on the skin in black, only to transfer to a shade red when met with cloth. 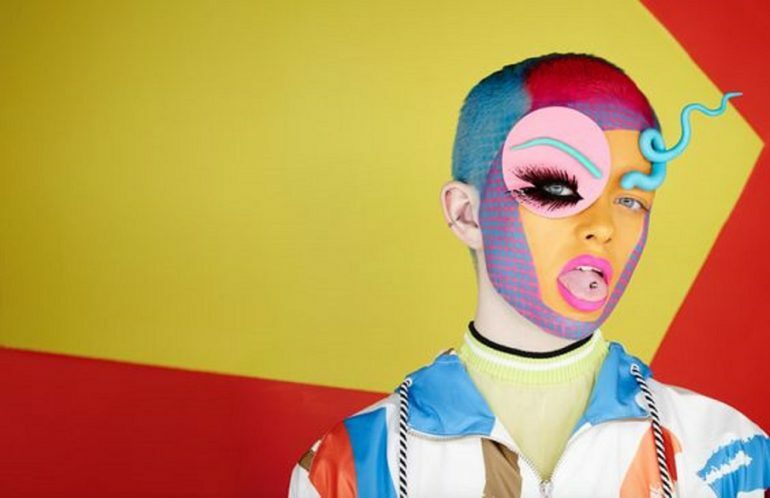 Gallimore mimics the background with blocks of neon popping off her eyes, and two-toned lips doubling up for a kiss. The next cosmetic application looks unreal, with patterned polka dots surrounding a yellow center. Her brows are done in sky-blue play-dough, while one eye is highlighted with a blast of faux lashes. Nick Irwin does her dew in kind, starting a buzz cut with an all Scarlet haze ~ a two-toned top of red/blue and then a triple that adds a strip of green. Her masqued face matches her hairs grace as she stares straight ahead with a plethora of shapes dancing over her skin. Scarlett sets the stage on fire with two of the most dramatic applications that allow us to linger in the past while projecting to the future. A compelling combination. Faces capture a sense of chaos, while being anchored by the idea of innocence. Angel exacts a sense of simplicity with much of her lovely skin left in it’s natural state. Somberness is in retreat as artistic symbolism speaks to the chaos of complete. By reaching back in time, we allow these bold, color combinations to come full circle. Bulbous brows are applied above the eyes, only to be outweighed by the plumping of pink, plastique lips. Black lines the entire lid with wings that fly out both sides, while blue-blush is matched by a stripe driving down her bald crown. This avant-garde look undergoes an alteration that appears authentic. Her entire skin turns red, marked by baby-blue spots that give off a dramatic effect. Here the baldness is truly beatiful as the naked head echos a sentiment of freedom. Alice Hurel dares us to go deeper while she invites us to explore. Emma Laird’s looks tells many stories. Her skin is a secret we long to know with colors that create a powerful show. Everything we thought we knew about face shapes is sent to the wind, as we discover a truth that comes from within. Her high forehead is matched by a tiny chin that comes to a chiseled point. Her wide set eyes sit on the side like seas of blue, while her nose is uncommon and her mouth is distinct. Each feature projects something unique. Her pretty is peculiar, the kind that people dream about. 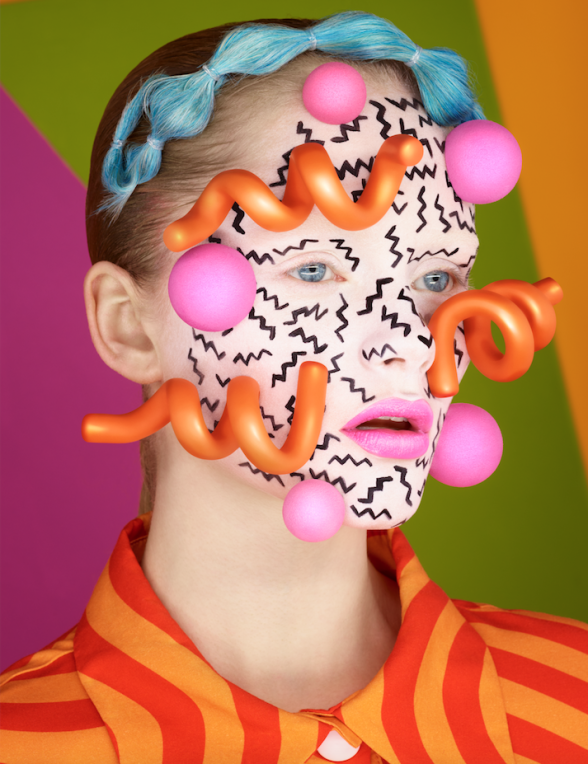 Pink balls and orange coils are attached to her skin, as she stares straight ahead, with zig-zag markings drawn over her face. Next we see an echo of soft shades under a blast of black, zebra like stripes, done as a 3-D rendering set to skin. These looks are dramatic. Multiple layers appear natural, creating street art marked with makeup. 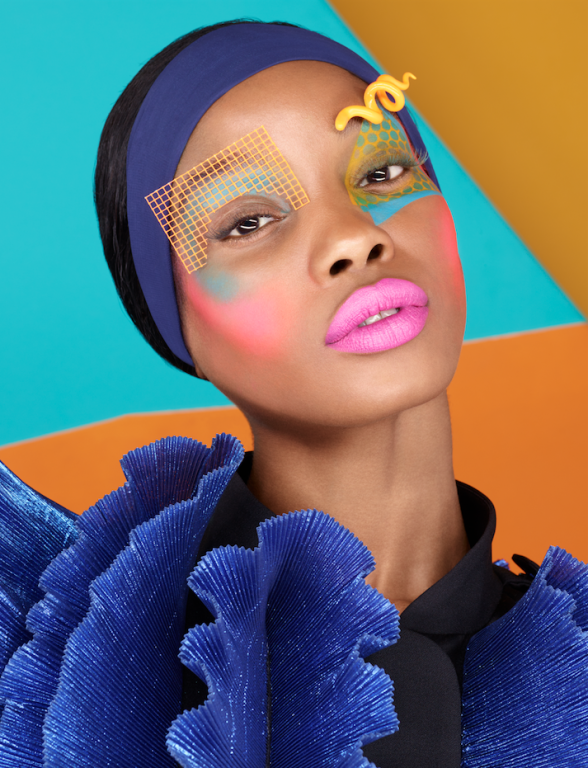 Rankin and Gallimore are an exquisite combination. I’m awestruck by the power of their connection that seems to spill onto the page. Each image is more exciting than the last as we sit back an enjoy the exquisite nature of the face.